Extreme weather is causing significant problems for smallholder farmers and others who depend on agricultural value chains in developing countries. Although value-chain analysis can help untangle the complex relationships within agricultural systems, it often has failed to take into account the effects of climate change. Climate-change assessments, meanwhile, often focus on the production node while neglecting other components of the value chain. In response to these shortcomings, the International Center for Tropical Agriculture (CIAT), in collaboration with the Government of Kenya, developed the climate risk profiles (CRP) approach. Using a case study from Nyandarua County in Kenya, we illustrate how this approach (i) supports identification of major climate risks and their impacts on the value chain, (ii) identifies adaptation interventions, and (iii) promotes the mainstreaming of climate-change considerations into development planning at the subnational level. Our results show that the magnitude of a climate risk varies across value chains. At the input and production stage, strategies for supporting climate-smart value chains include the following: improving access to input markets, supporting diversification and value addition, provision of climate-smart production technologies, dissemination of climate information services, and making financial and insurance services available. At the harvesting, processing and marketing stages, useful interventions would include strengthening farmer organization, investing in climate-proofed infrastructure including roads and facilities for storage, processing and improving access to output markets. Finally, climate-change adaptation along the value chain would be improved by strengthening existing institutions, exploring public-private partnerships and adopting coherent local policies. Mwongera, Caroline; Nowak, Andreea; Notenbaert, An Maria Omer; Grey, Sebastian; Osiemi, Jamleck; Kinyua, Ivy; Lizarazo, Miguel & Gilvetz, Evan. 2019. Climate-Smart Agricultural Value Chains: Risks and Perspectives. 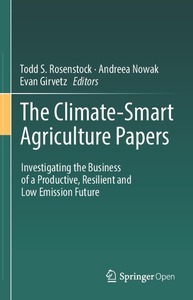 In: Rosenstock T., Nowak A., Girvetz E. (eds) The Climate-Smart Agriculture Papers. Springer, Cham . 235-245 p.